Buy this book with Service-Oriented Architecture : A Field Guide... by Thomas Erl today! 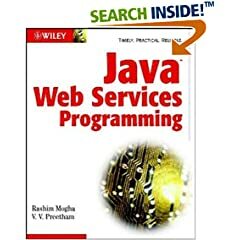 Your in-depth guide to programming with the Java Web Services Developer Pack The Java Web Services Developer Pack (Java WSDP) gives you all the tools you need to start creating Web services. Packed with lucid explanations and lots of code examples, this valuable guide covers the Web services framework and the open standards that support it, including XML, WSDL, SOAP, and UDDI. Learn to implement these standards using the WSDP, from working with the Java Web services architecture and developing JavaServer Pages and servlets to making the most of JAXP, JAXB, JAX-RPC, JAXR, and the rest of the Java XML toolset. You ll learn how to: Understand the new Web services model Get a handle on the Web services technology stack Harness XML, WSDL, SOAP, UDDI, and other standards Design a Web service using Java architecture Integrate JSPs, servlets, and other J2EE APIs into Web services Implement Web services using Java s XML APIs Work with JAXP, JAXB, JAXM, JAX-RPC, JAXR, and JSTL The companion Web site includes all of the source code from the book. The Java Web Services Developer Pack (Java WSDP) gives you all the tools you need to start creating Web services. Packed with lucid explanations and lots of code examples, this valuable guide covers the Web services framework and the open standards that support it, including XML, WSDL, SOAP, and UDDI. Learn to implement these standards using the WSDP, from working with the Java Web services architecture and developing JavaServer Pages and servlets to making the most of JAXP, JAXB, JAX-RPC, JAXR, and the rest of the Java XML toolset. The companion Web site includes all of the source code from the book. Average Customer Review: based on 9 reviews. This book is one of the few books that i have come across that covers the XML structures of the Web-Services so In-depth. Most of the other books starts of directly with the programming aspects. But in this book, there is a very detailed explanation of the SOAP, WSDL and UDDI structures. Such thorough explanation helps any programmer to get a very good understanding on the XML centric architecture of the Web Services framework. The most useful part of the book is the running theory of how web services works. Also the book does not try to cover too many things at the same time. The simple approach taken by the authors to keep simple things seperate from the more complex APIs provides good advantage to the readers to understand webservices very easily. Probably the authors should come-out with a Volume 2 of the book, which should cover other complex APIs. I bought this book in the hope of learning everything about Web Services. But it looks like their is so much to learn than what meets the eye. This book is very good for intermediate programmers only. Advanced concepts like security are left out. The explanations in the book is very good. The APIs are not all that old, though some of them have been replaced by newer versions. The examples used is very easy to understand and well explained. There are few places where i found grammatical mistakes. There are some typos too. Overall a very good book to practically understand webservices. Though the book has obsolete code, the explanations in the book are very clear and helpful. I guess the authors released the book too early.. The webservices APIs are ever changing and is not yet finalized. Either ways, this book is very good for beginners like me..
- Chapter 1 and 2 First 50 pages on XML and WS basics ! No programmer's view, abolutely waste of time to read. - Chapter 3, WSDL does'nt provide practical example, How to generate WSDL and no discussion on elements and tools. - Chapter 4 SOAP uses Apache SOAP (an older version), the code does'nt run ! Missing discussion SOAP - Document style webservices, SOAP security ! - Chapter 5 UDDI does'nt discuss on a real world example. - Chapter 6 and 7 talks on JSP and Servlets (Meaningless!!! ), J2EE Webservices (MISSING ! How to expose EJB as Webservices) ...Unfortunaltely no examples..on how to expose a J2EE Application as Web services ! - Chapter 8 and 9 discussing JAXP and JAXB....missing Web services context ! - Chapter 12 JAXR reproduces JWSDP 1.0 provided example. No discussion on ebXML RR usage ! Missing discussion on XIndice ! - Chapter 13 JSTL !!! It is not a core component of Java Web services... It is a tag library for JSP !! Author absolutely misleading readers ! A Waste of Money. Authors misleading the readers at many chapters, Too basic example reproducing JWSDP beta examples... No advanced concepts like security and Interoperability. alright, alright, i'll change my review of this book... after tackling a fairly complicated web services project, i found that this book is a bit lacking in some areas... the most obvious to me now is the lack of coverage of Dynamic Proxy and Dynamic Interface Invocation. the coverage of JAX-RPC is also a bit shallow... just one 'hello world' example, and nothing more. try expanding on that material and try returning an array of Strings or ints! sure, you can still easily code a web service from that, but try writing a client for a service that returns a complex type like an array! the book really should have covered dyanamic proxy and Dynamic Invocation Interface in this respect... i mean, you cant realistically expect that a real-world application would settle for handing out stubs and ties for clients to use, eh? ok so it might still be a great beginner's book -- the authors DO explain clearly what little topics they do cover, after all -- but i have to warn you, you'll outgrow it really quickly when you start dealing with real-world situations! heck the most useful thing to me was the simple hello-world JAX-RPC example -- beyond that i had no more use of the book...i didnt even refer to the book at all when i needed to tackle security, WSDL, and UDDI! This book is a good and comprehensive guide to Java Web services. Check out your latest Gold Box offers--you never know what you'll find!